Are you naturally skinny? Big boned? Genetically blessed with perfect proportions? Each of us is born with a certain body type, and the more you understand yours, the more effective you’ll be at improving your physique. 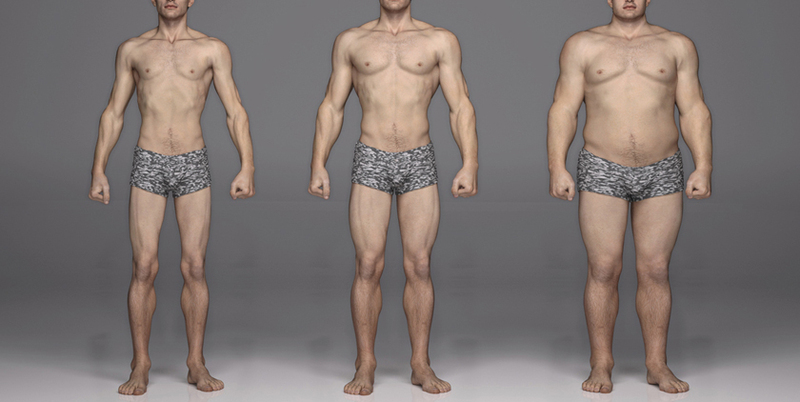 In the 1940s, three basic body types were identified by a psychologist, W.H. Sheldon: ectomorph, endomorph and mesomorph. You might not match up perfectly with a single type, but understanding the differences can help you optimize your workouts. You know that one friend that can eat, and eat, and eat and never gain a pound? They’re probably an ectomorph. This body type is naturally lean, with narrow shoulders and hips, and a fast metabolism. Many tall people fall into this category, but height alone is not a determining factor. Although a slim physique may seem like a blessing, this body type typically struggles to gain muscle mass. It’s not impossible though. Ectomorphs should train fairly heavy, at a slow pace, with longer rest periods between sets. Don’t train too often or for too long, and keep aerobic activities to a minimum. Eat a diet high in quality, whole foods. You’ll likely need to eat more than you’re used to, and more often than you’re used to. A mass gainer like Bulk Muscle™ is a great option for a meal replacement. Yes, “big boned” is actually a thing. Endomorphs have naturally heavier bone structures, with wide waists and hips that form square torsos. Unlike ectomorphs, endomorphs can add mass easily thanks to a slower metabolism. On the flip side, this also means they have to work harder to get lean. To achieve a lean physique as an endomorph, you have to be diligent about your training and nutrition; adopt it as a lifestyle. Do strength training with moderate weights, at a fast pace. Use it as a form of cardio, making sure to get your heart pumping. You should also add regular traditional cardio workouts to your routine. This will help you burn off fat and keep it off. When it comes to your diet, you’ll need to track your calories. Eat small, frequent meals, and avoid sugar, sweets and junk food at all costs. Protein shakes are an easy meal option, and ISO HD™ is the purest, low-calorie protein we offer. Many of the greatest bodybuilders in history are mesomorphs. This lucky body type has naturally pleasing proportions, with wide clavicles and narrow hips that form the coveted V-taper. They’re also blessed with the ideal metabolism, easily gaining muscle, not fat. Train with moderate to heavy weights and keep a moderate pace. You can train often and for long periods of time, but don’t overdo it. When you’re happy with your muscle size, simply train to maintain. Cardio should come in the form of aerobic activities; it doesn’t have to be a regular focus. Since mesomorphs naturally send nutrients to muscle, not fat, nutrition is pretty straightforward. Base your diet on whole foods, get your protein and your body will do the rest.